I feel a little silly including this book in a blog of my reading for the year, but, hey, it’s a book, I read it, and someone might care. 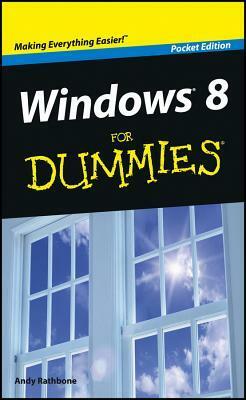 I picked up Windows 8 For Dummies because I recently got a new computer and it runs Windows 8, which is completely different from previous Windows operating systems. The folks at Staples offer a tutorial on Windows 8, but I didn’t find it terribly helpful. So I got the pocket edition of this guide, just to get me started, figuring I’d learn most of the rest of what I needed simply by exploring on my own. Which is how I’ve learned every other version of Windows I have used, which is most of them. But Windows 8 is different, and it almost doesn’t make sense on a PC. It’s designed for a touch screen environment–the new generation of computers and tablets. I’m not there yet, however, so the “app-based” OS is mostly a novelty. For most purposes, the new Start Screen–which is where all the “apps” reside–is just another version of the traditional Desktop, except that there’s also a Desktop, exactly like the old Desktop, hidden underneath. Most of this book wasn’t of much use, but it does have some good secrets that I hadn’t yet discovered on my own, like “snapping” apps to the Desktop (a keyboard method of showing both an app (the calendar, for example) and a program operating in a Window (Word, for example) at the same time. That’s handy to know. But truly, there wasn’t much more than that. Note that this is the pocket edition, however. There are several other editions, and I suppose it’s possible that one of them is more helpful than this one is.